All Amplifiers that go through the RAT Workshop are 'PAT' Approved, Labeled and Logged. 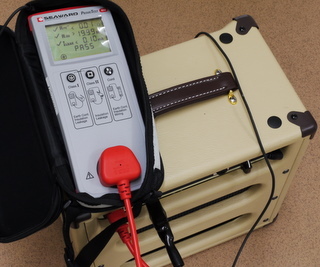 The 'PAT' Procedure performs Four tests to Certify that the Amplifier is Electrically Safe. 1. - (Rpe) - Earth Continuity - Checks that there is a Physical Connection between any exposed metal Surfaces on the Amplifier and Mains Earth. Without this Connection a Valve Amplifier would be Lethal. 2.- (Riso) - Insulation Resistance - Checks for Short Circuits or any Damaged Insulation. 3.- (Ileak) - Leakage Current - Checks the Leakage Current between the Live and Earth Connections. 4. - Cord Test - Checks for Live and Neutral Open Circuits, Short Circuits or Reversed Polarity. If all of the Above tests fall within the Defined limits, the Test Unit will issue a 'PASS' indicating that the Amp is Electrically Safe. A Label is Attached to the Rear Panel of the Amp showing the 'PASS' Date. All Valve Amplifiers use Very High DC Voltage. In a 5 Watt Amp this DC Voltage could exceed 400 Volts and in the Event of a Fault, it is Important that a Fuse Blows. For that to happen, the Correct Fuse MUST be Fitted and the Amplifier MUST be Earthed. This is for your Safety as the Last thing you want is 400 Volts DC waiting to GRAB you. It Hurts. You would be surprised how many Brand New Amps Fail this Basic Testing. I regularly find New Amps with Reversed Polarity Mains Connections and/or Poor Earthing.